“Jamie,” I said very soft­ly. Sun­light flashed on the met­al of my sil­ver wed­ding ring. He took hold of it between thumb and fore­fin­ger, and slid the lit­tle met­al cir­clet gen­tly up and down my fin­ger, so loose that it didn’t even catch on the bony knuck­le. 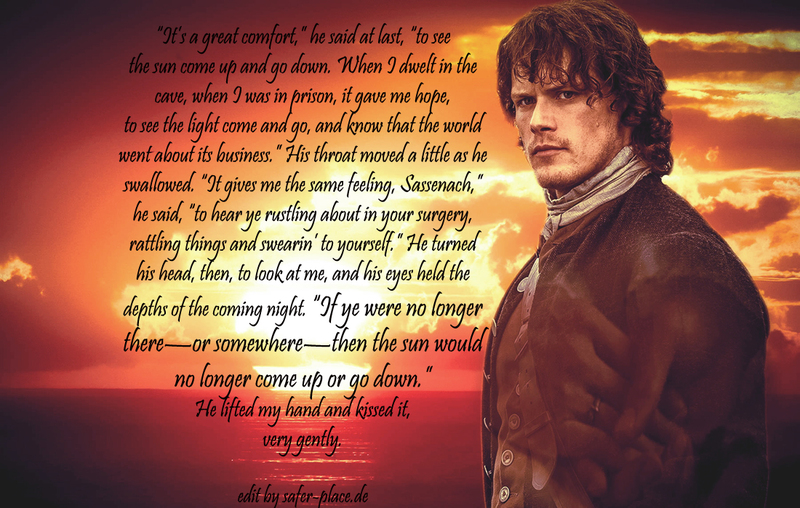 “Ye won’t.” He fold­ed my fin­gers closed, his own hand clos­ing large and warm around mine. He sat silent for a time, and we watched the bar of sun creep slow­ly across the coun­ter­pane. Adso had moved with it, to stay in its warmth, and the light tipped his fur with a soft sil­ver glow, the fine hairs that edged his ears tiny and dis­tinct. “It’s a great com­fort,” he said at last, “to see the sun come up and go down. When I dwelt in the cave, when I was in prison, it gave me hope, to see the light come and go, and know that the world went about its business.”He was look­ing out the win­dow, toward the blue dis­tance where the sky dark­ened toward infin­i­ty. His throat moved a lit­tle as he swal­lowed. “It gives me the same feel­ing, Sasse­nach,” he said, “to hear ye rustling about in your surgery, rat­tling things and swearin’ to your­self.” He turned his head, then, to look at me, and his eyes held the depths of the com­ing night. “If ye were no longer there—or some­where—” he said very soft­ly, “then the sun would no longer come up or go down.” He lift­ed my hand and kissed it, very gen­tly. He laid it, closed around my ring, upon my chest, rose, and left. As always, touch­ing and love­ly! Anoth­er fav of mi e from the books! Thank you!